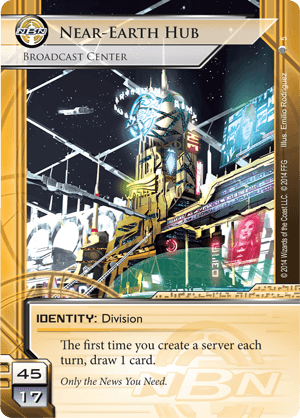 Its ability makes any deck better regardless of build - it allows you to draw into your Biotic Labor, Scorched Earth or AstroScript Pilot Program even faster. Like EtF or Kate, it rewards you for doing something you were going to do anyway. 17 influence is great but in NBN it's crazy good because every corp deck is running 3 x Jackson Howard, so you're basically playing with 5 more influence than your standard 15-influence non-NBN corp deck. 3 x Scorched/Biotic and Jackson with 5 influence to spare is fantastic. Making News, TWIY and Haarpsichord all have their merits but it's hard to compete with the speed, consistency and flexibility that NEH offers. The new NBN IDs in Data and Destiny look really interesting, but I think it's a fair guess that NEH will still be the king through the next cycles unless the conventional fast advance and Scorched builds get nerfed hard.